The state's first ruler, Prime Minister Donduk, sought to strengthen ties with Mongolia and establish Buddhism as the state religion. This unsettled the Kremlin, which orchestrated a coup carried out in 1929 by five young Tuvan graduates of Moscow's 'Communist University of the Toilers of the East'. In 1930 the pro-Soviet region discarded the state's Tibetan-Mongol script in favor of a Latin alphabet designed for Tuva by Russian linguists, and in 1943 Cyrillic script replaced the Latin. Under the leadership of Party Secretary Toka, ethnic Russians were granted full citizenship rights and Buddhist and Mongol influences on the Tuvan state and society were systematically reduced. In February of 1990, the Tuvan Democratic Movement was founded by Kaadyr-ool Bicheldei, a philologist at Kyzyl University. The party aimed to provide jobs and housing (both were in short supply), and also to improve the status of Tuvan language and culture. Later on in the year there was a wave of attacks against Tuva's sizeable Russian community, resulting in 88 deaths. Russian troops eventually were called in. Many Russians moved out of the republic during this period. To this day, Tuva remains remote and difficult to access. Religious practice declined under the restrictive policies of the Soviet period but revived somewhat in the early 1990s. Tuva is also the only country in the world to have shamanism as an official religion. The most important facilities of higher education include the Tuvan State University and the Tuvan Institute of Humanitarian Research, both located in the capital Kyzyl. In the 1920s and 1930s, postage stamps from Tuva were issued. Many philatelists, including famous physicist Richard Feynman, have been fascinated with the far-away and obscure land of Tuva because of these stamps. The stamps were issued mainly during the brief period of Tuvan independence, and had many philatelists in a furor, as they did not conform to various standards. Feynman's efforts to reach Tuva are chronicled in the book Tuva or Bust!. Sergey Shoygu, Russia's Emergencies minister, is Tuvan. ^ Tuva and Sayan Mountains. Geographic Bureau — Siberia and Pacific. Retrieved on 2006-10-26. DONAHOE, Brian 2002. "Hey, you! Get offa my taiga! ": Comparing the sense of property rights among the Tofa and Tozhu-Tyva. Max Planck Institute for Social Anthropology working papers, nº 38. Halle/Saale: Max Planck Institute for Social Anthropology, Max-Planck-Gesellschaft. ISSN 1615-4568. (Russian) Official website of Tuva. (English) Tuva Discussion Group on Yahoo! Groups. (English) Friends of Tuva website. (English) (Japanese) Friends of Tuva, Japan. (English) Some Tuvan stamps issued in 1920s/1930s. (English) Genghis Blues, official movie site. (English) Animated slideshow presentations of Tuva. (English) (Russian) (Japanese) (Esperanto) More completed collection of Tuva Stamps(1926-1943). (English) The Tuva Trader; Tuva and Richard Feynman media, products and information. (English) Buga-shadara A traditional Tuvan boardgame. The Tuva Republic /təˈvɑː ɹɪˈpʌblɪk/ (Russian: Респу́блика Тыва́; Tuvan: Тыва Республика) is a federal subject of Russia (a republic). 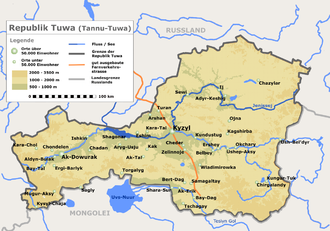 Tuva was made the Tuvan Autonomous Oblast and then became the Tuva ASSR on October 10, 1961. Tuva was a signatory to the March 31, 1992 treaty that created the Russian Federation. Tuva, also known as Tannu Uriankhai, was controlled by the Mongols from the 13th to 18th centuries, then under Manchu rule from 1757 to 1911. During the 1911 revolution in China, tsarist Russia fomented a separatist movement among the Tuvans, whose territory became nominally independent before being made a Russian protectorate in 1914. It was annexed by the USSR in 1944 as an autonomous region and became an autonomous republic in 1961.